One of the things I’m always happy to do more of is drink tea together with others, so when Anna from the Tea Squirrel said we should get together and do a tea tasting my answer was a resounding yes! Anna graciously provided the space nad the brewing gear. I brought the tea–an interesting new tea called Yunnan Yellow Silk. YYS is a black tea with the unusual added step of “yellowing” the leaves before they are processed into a black tea. I knew I needed to buy it as soon as I saw it on Instagram. Here’s the thing about this tea: I actually brewed it myself a few times before bringing it to Anna. The first time I brewed it I was blown away, but I found I struggled to reproduce the same results in subsequent sessions. Convinced I was doing something “wrong”, I was keen to share it with Anna and get her thoughts on it. I start by heating the water to 185F, which is definitely on the cool side for a black tea. I wash the leaves and then we’re off to the races. As soon as the water hits the dry leaves in the first steep it starts to froth. Just looking at the liquor in the gaiwan and later in the cup I can see how viscous it is. The color of the liquor early on is a stunning pink-gold blend of apricot and honey. The flavor of the first steep starts with a gentle stone fruit sweetness and finishes with a straw/hay note. It’s very reminiscent of the flavors found in white tea. For the second steep I added time and heat, which is a new-to-me strategy for brewing blacks I’ve been toying with (thanks for the tip Teaful Co). Anna compliments me on my water pouring technique and I’m pretty pleased because I’ve been practicing. Back in the tea, the sweetness is still there but the astringency deepens. 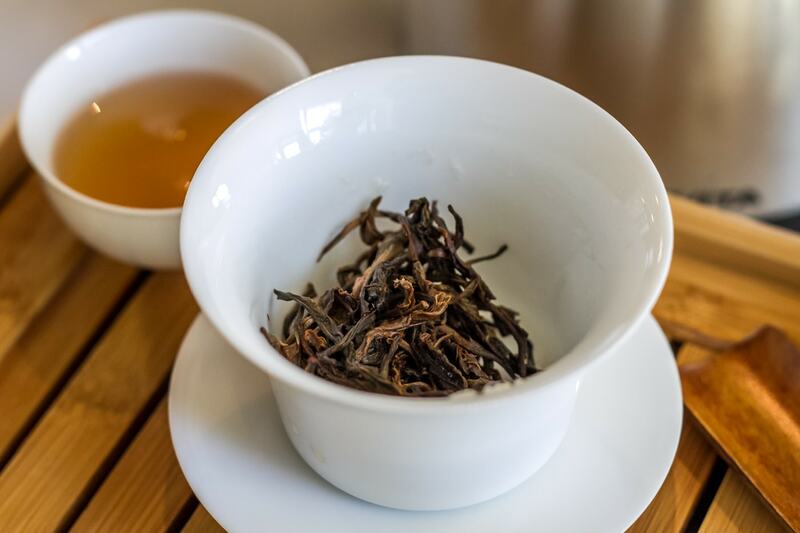 The tea now starts to show more of the traditional malty notes typical of Yunnan black teas. By the third cup the color of the liquor loses its pink-golden luster and becomes more of a darker red-brown. 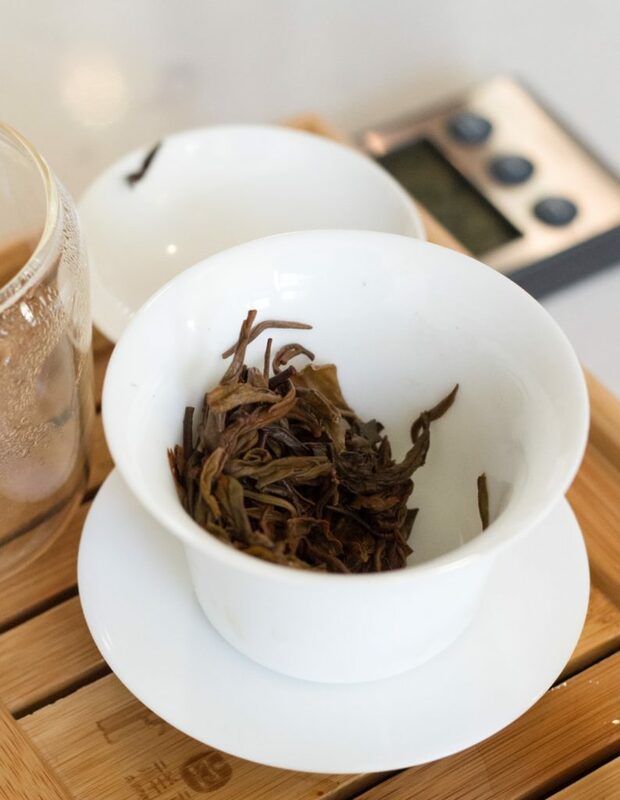 The dark color is almost like a light cup of ripe puer. The heat is up to 195F and I find myself deep in flavor territory I’m not altogether comfortable with. At this point I can feel the stickiness of the tannins on my tongue. The flavor of the tea turns robust and bold in a way that takes me outside my comfort zone. The wet leaves of the Yunnan Yellow Silk show a very obvious yellowing on each leaf. By now the tea is working its magic. I feel warm like I’m deep inside a tea bear hug. Our conversation takes a turn towards the serious, but it doesn’t feel heavy. The words we exchange are sliding along on gears greased by good tea. This is the best part of tasting together. I share with Anna the story of my attempts at brewing this tea solo. I tell her about how when I hit this point brewing and drinking YYS alone, I wonder whether I’m screwing it up. As an experienced tea drinker, I was hoping her interpretation of the tea would provide a counterpoint to my own and I could learn something as a result. Anna hits me with a shocker: she loves the third steep! Just like a glass of the bold red wine she also loves, the deep astringency and full-bodied flavor is something she personally enjoys. I felt relieved, because I legitimately thought I was doing something “wrong” with my brewing. It turns out the only thing I was doing wrong was brewing the tea in a way that didn’t suit my taste! As an experiment, she suggests we keep the same temperature but cut about 10-15 seconds off the steeping time. This produces a fourth steep that is beautifully round and balanced. The previous bold astringency has softened into the pleasant bitterness akin to an 80% dark chocolate bar. The flavor has gained a round and balanced quality that is simply amazing. By the fifth steep, the leaves are about done and we’re running long on time. We decide to call it quits. I leave Anna with a bit of the Yunnan Yellow Silk to enjoy on her own. I pack a few of her homemade squirrel cookies in my bag for the wife and I.
I wanted to show off how big and full the leaves are but only succeeded in showing how massive my hand is. Let me start by wrapping up the “review” of sorts on this tea. In short, the Yunnan Yellow Silk is an incredible tea. It tastes delicious, tolerates all kinds of brewing parameters, and offers up a vast array of experiences for those who are unafraid to experiment. However, as good as this tea is by itself, it was made that much better by sharing it with Anna. 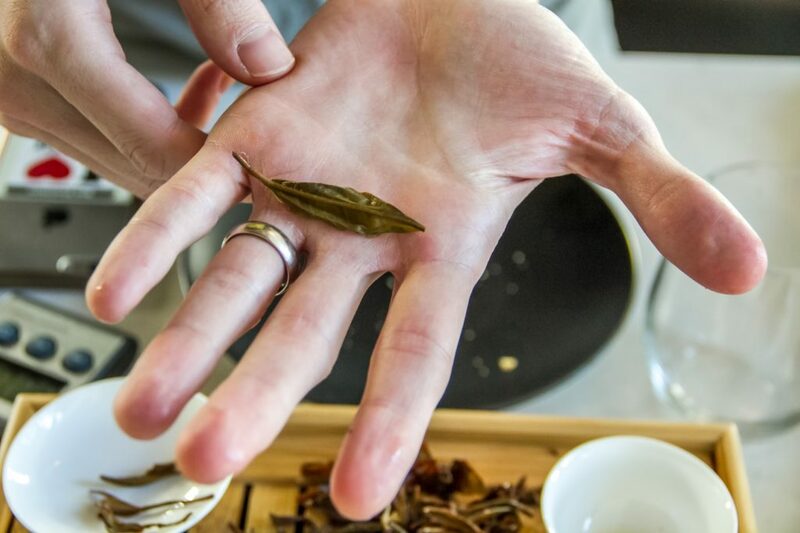 The point is, it’s very difficult to say what’s “right” and “wrong” when it comes to tea because ultimately the enjoyment of tea is subjective. One man’s bitter and over-brewed concoction is another woman’s strong and full-bodied treasure. Drinking tea with Anna gave me the opportunity to learn this lesson all over again and I’m thankful for it. I hope it’s a lesson I never stop learning. I left our tasting session riding high because I felt I had made a real connection with Anna. That connection showed me something special, both in the tea and in our friendship. I left feeling even further convinced by the power of tea to bring the people who enjoy it together in incredible ways. I simply cannot recommend drinking tea together with others enough. Don’t worry if you’re not a Tea Master trained in some ancient Chinese tea house in the craggy peaks of Yunnan. Just grab someone who’s happy to drink whatever you’re brewing and have a great time! This was an awesome experience and I hope to bring more of these Tasting Together posts to you in the future. Stay tuned!